iDRIVE TV - So, what’s the next step? Home Take Action So, what’s the next step? Here is how you can get started on your journey to make a real difference in the world. Use this form to find your focus and jump-start your iDrive mission. Have you already filled out a form with pen and paper? Snap a photo with your phone and send pictures via e-mail here. Need ideas? Check out the hot topics we’ve put together. Then define your mission and vision for change. Finalize and pitch your initiative to the iDrive team. We are here to support! Working on a school project? Have your teacher or school advisor review your pitch sheet before you send it to iDrive. Create an action plan for your iDrive Movement. Working on a school project? Have your teacher or school advisor guide your project plan. 3 Select an iDrive Outreach and Empowerment Project. Choose how you will carry your message to the community and the world by selecting an Empowerment Project. Reach Out: Visual Media and Info. Speak Up and Listen: Plan a Workshop or Roundtable. Make it Real with Roleplay: Write a script. Perform a play or record a dramatization. Go Public with a PSA: Record a 30-60 second Public Service Announcement. Short Form Documentary. Produce a 3-5 minute video. Watch Here. Mass Media. Op-Ed Article (600-700 words). Awareness Week Campaign. Raise Awareness on Campus or on Social Media. Working on a school project? Have your teacher or school advisor help you acquire the resources that you need to successfully complete your project. 4 Make Your Voice Heard. Share your Empowerment Project with iDrive. Want to make an even bigger impact? 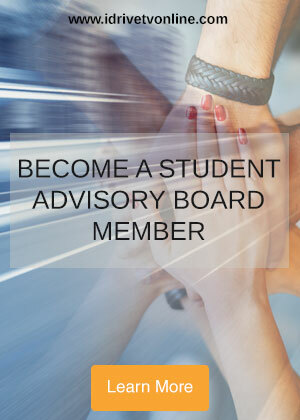 Join the iDrive Student Advisory Board. Share the journey! Follow us!